I don't think I'll ever forget the first time I met Robert Hager. It was about a year ago, a balmy Friday morning in September, and I showed up at the Budget Motel on Fourth Street in Eureka, which the city was condemning with little notice to residents. Hager was standing in the parking lot next to his wife, Kathleen, his wild spray of gray hair jutting from underneath his U.S. Army baseball hat. 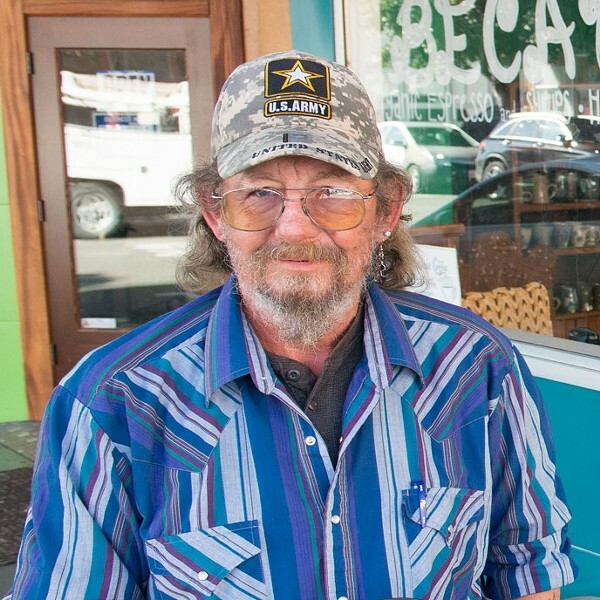 As I spoke to Robert, he explained that he and his wife, both veterans, had lived at the Budget for about a year. They paid about $650 a month for a room with a leak in the ceiling, soaked carpets and a cockroach infestation. The place was a mess but it was better than scraping along on the streets, Robert told me, and those were their options. Later that day, I watched a county social worker help Kathleen into a car as Robert packed what was left of their stuff in the trunk. As the nondescript sedan pulled away, I remember wondering if they had any chance, if there was any hope of them even finding a rundown room in another crappy long-stay hotel or if they were doomed to spend the rest of their days in a shelter, or worse. It turns out I was back in touch with them soon. A Journal letter writer had questioned the details of their military service after I quoted Robert referring to Kathleen as a former Army Ranger in my story about the Budget. Turns out the Rangers didn't begin admitting women until long after Kathleen would have been discharged and the writer wanted to know if Robert had made up her service record to garner sympathy. So it was about a week after my story on the Budget hit newsstands that the Hagers showed up at the Journal's office, military discharge papers in hand, wanting to set the record straight. I don't know how we got our wires crossed on the Army Ranger quote, if I misunderstood what Robert was saying or he misspoke. But I do know that it struck me how important it was to Robert that he not be made to feel like a liar, to make sure that I knew — if no one else did — that both he and Kathleen served and were honorably discharged. A few weeks later I got confirmation from National Personnel Records Center. Over the ensuing months, I'd see them around Old Town, always together, usually at a coffee shop or on the move somewhere. Sometimes we'd stop and chat, and they'd update me on how things were going at the Eureka Rescue Mission or the Veteran's Resource Center. Occasionally Robert would show me a poem he'd written and, at some point, I started urging him to submit one to the Journal for our weekly feature. One day he told me that during a prior homeless stint in Wisconsin or some other far off place, he'd written what he called a "poor man's survival guide," a kind of how-to book on being on the streets without shelter. I was intrigued. I caught up with Robert again about a month ago after not seeing him for a while. 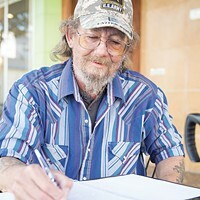 He told me Kathleen had passed away, that he was staying at the Vets' Center in limbo and that he was writing again, working on a new version of his book. I urged him to let us run a piece of it in the Journal and, thankfully, he agreed and the result is this week's cover story. 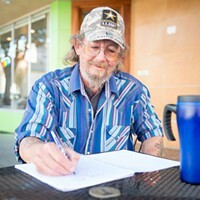 I think the 20 or so pointers Robert offers to help homeless people get back on their feet are a good start. Obviously, the homeless population is not a monolith and there's no one-size-fits-all approach. Some are too mentally ill or strung out to follow the steps, and there are people who will never be able to live on their own, let alone hold down a job. But I think Robert's insights have value, both for those trying to claw their way off the streets and for the rest of us, who collectively need to better understand the challenges they face. I'll also add that it feels very good to help someone earn a paycheck who really needs one.